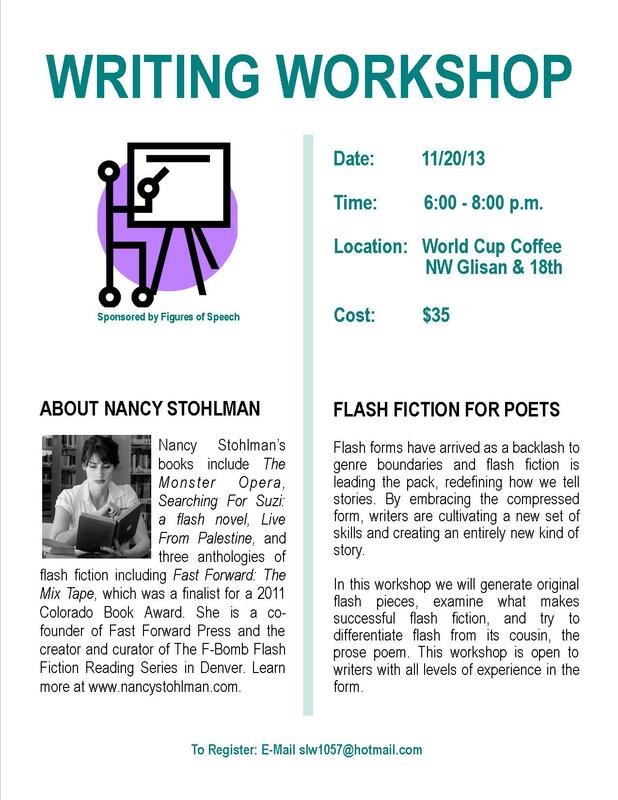 Nancy Stohlman and two Flash Fiction Events coming to Portland Nov 19-20! Nancy Stohlman is coming to Portland for 2 Flash Fiction events next week! Flash forms have arrived as backlash to genre boundaries and flash fiction is leading the pack, redefining how we tell stories. By embracing the compressed form, writers are cultivating a new set of skills and creating an entirely new kind of story. In this workshop we will generate original flash pieces, examine what makes successful flash fiction, and try to differentiate flash from its cousin, the prose poem. This workshop is open to writers with all levels of experience in the form. World Cup Coffee Meeting Room. World Cup is located on the corner of NW Glisan and 18th ave.
Portland Peeps! Flash fiction workshops next week!